A prominent civil rights attorney announced Wednesday morning that she will make a bid to move to the other side of the bench next year. 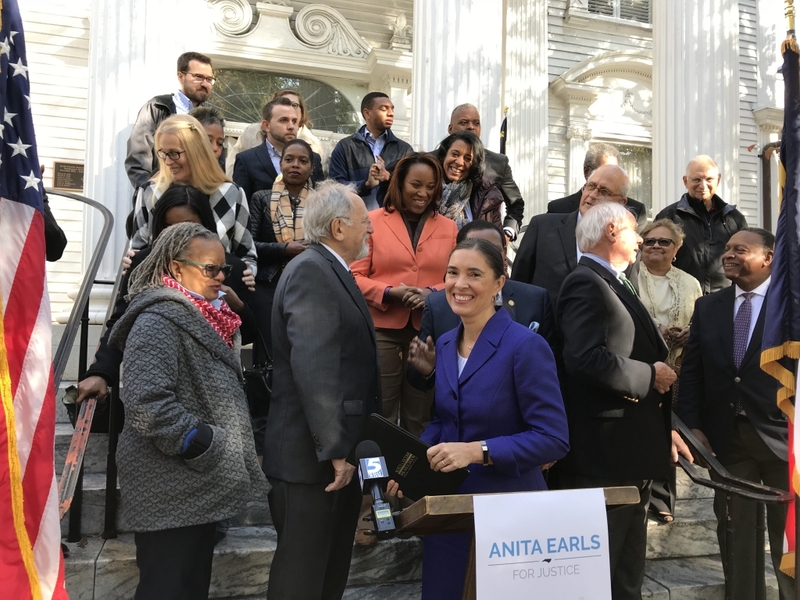 Anita Earls, who is the Executive Director of the Southern Coalition for Social Justice (SCSJ), will run for a North Carolina Supreme Court seat in the 2018 election, challenging incumbent Justice Barbara Jackson, who is a registered Republican. Jackson’s eight-year term ends next year. Earls, 57 of Durham, made the announcement at the Democratic Party headquarters on Hillsborough Street. Prior to founding SCSJ, Earls was director of advocacy at the UNC Center for Civil Rights and director of the Voting Rights Project at the Lawyers’ Committee for Civil Rights Under Law, according to her online biographical information. She was a deputy assistant attorney general in the Civil Rights Division of the U.S. Department of Justice during the Clinton Administration. SCSJ will continue on, Earls said. Earls has also served on the Equal Access to Justice Commission and the North Carolina Board of Elections. She has taught at Duke University, the University of North Carolina at Chapel Hill and the University of Maryland. She is the lead attorney in North Carolina v. Covington, the state’s ongoing racial gerrymandering case, and for the League of Women Voters in a partisan gerrymandering case that went to trial last month in a federal court. She also led a challenge in state court to uphold North Carolinians’ right to vote even without a photo ID. Earls will phase out her role in the ongoing cases by the end of the year so that she can campaign, she said. She said the qualification she hopes voters will evaluate most is whether she can fairly and faithfully apply the law equally to everyone whose case comes before the Supreme Court. “I believe my record demonstrates that I have an unflinching dedication to the principle of equality before the law,” she added. She noted later that she had sued Democrats and Republicans alike in the past. Former North Carolina Gov. Jim Hunt and current U.S. Rep. G.K. Butterfield released statements endorsing Earls. Butterfield said Earls has the intellect and integrity needed on North Carolina State Supreme Court. Lawmakers have been taking aim at the independence of the judiciary in the last year. They passed measures that require judges and justices to run for election using party labels. After Justice Mike Morgan’s win in the 2016 election, the state Supreme Court was tipped to a 4-3 Democratic majority. There was also a bill passed in the most recent special session that eliminates judicial primaries next year, which means anyone who meets state requirements to run for a Supreme Court seat can be put on the 2018 ballot. Jackson has already established her bid for reelection and Earls is the only other candidate thus far to announce her plans to run for the seat. The last time a judicial primary was eliminated for a North Carolina Supreme Court seat was in November 2004. Justice Paul Newby won over seven other candidates with 22.59 percent of the vote, according to the State Board of Elections and Ethics Enforcement. The candidate filing period for all 2018 judicial offices is from noon on June 18 to noon on June 29. There are other changes that could be made before next year’s elections, including a potential merit selection plan that the Senate has been touting. Earls said the voters will ultimately make the decision about how judges are selected. “I think it is so important that voters decide who our judges are, not politicians,” Earls said.